Ever since Disney’s Frozen took the world by storm (catch the pun? ), I cannot hear the words “Let it Go” without thinking of the Oscar-winning pop anthem that many have earmarked as the theme song for their life, or at least their year. 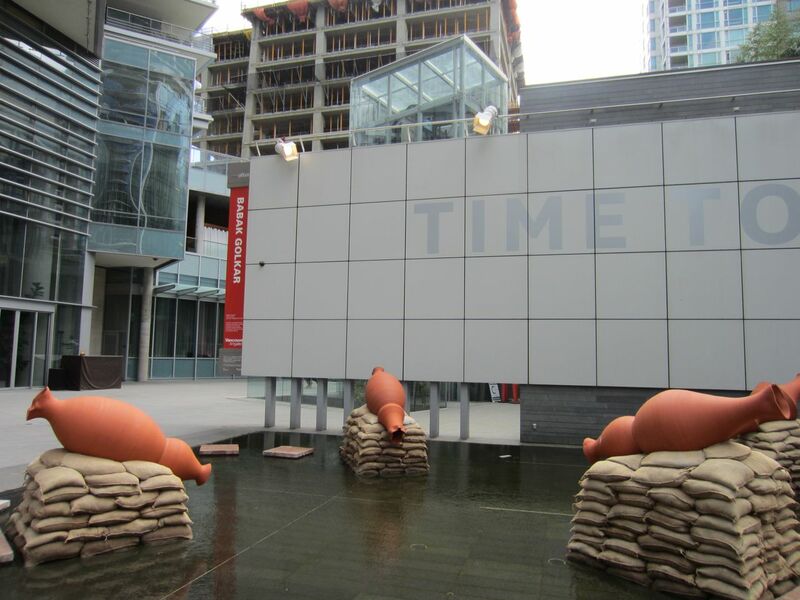 So when I came across this Vancouver Art Gallery offsite exhibit on West Georgia Street between Thurlow and Bute, the tune was instantly running through my head. 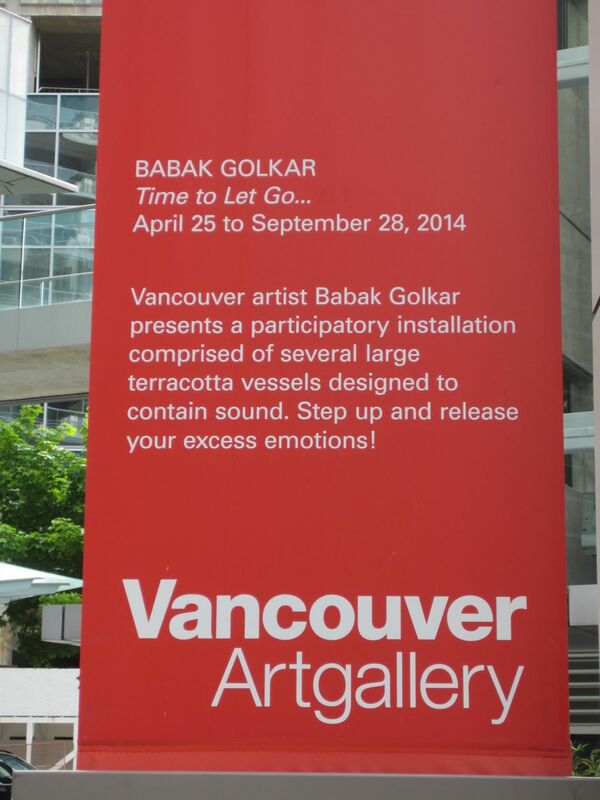 Time to Let Go by Babak Golkar. 2014. Time To Let Go. Yes. 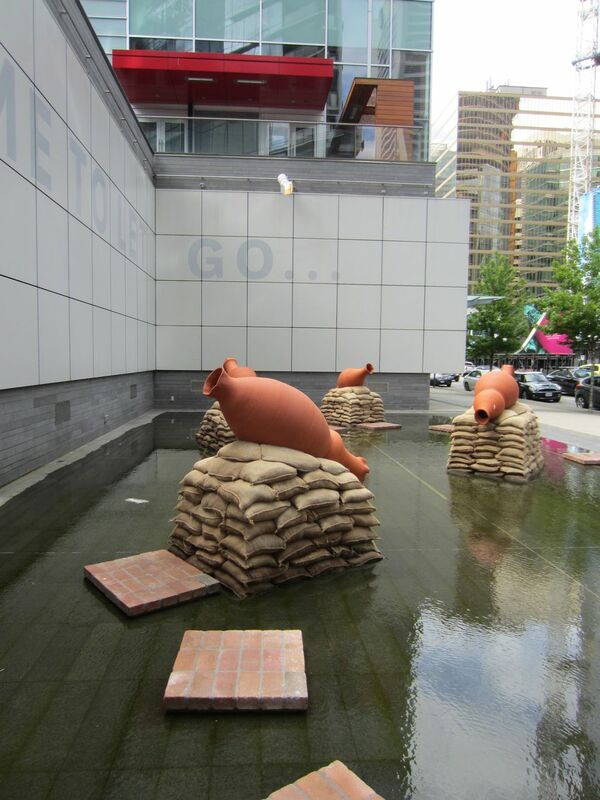 I don’t know if it was the words or the still water or the ancient terracotta vessels sitting atop burlap sacks, but something about this site was extremely arresting. It looked participatory, but without reading the description, I didn’t know what to do with it. I didn’t know how to participate. Really? Release my emotions? I looked around. There weren’t any people walking by, but there were plenty of cars sitting at stop lights whose passengers could easily see me through their windows. I didn’t want to embarrass myself or anything because, you know, that’s the absolute worst thing that can happen in public. But the other part of me really wanted to participate. I’m glad my curiosity overtakes my shyness at moments like this. I went up to one of the pots and said something quietly. My voice echoed several times inside—a deep echo that made me feel like I was speaking into the womb of the earth. There’s something about being given permission to scream that is extremely liberating. And not just screaming on top of a mountain or in a field of wildflowers because it’s safe to do that, but to scream in the city—now that’s different. It’s no accident the offsite exhibit is placed on a major downtown street hemmed in by commercial buildings, condos, and hotels. Vancouver itself is a hemmed-in city, mountains on one side, ocean on the other. And don’t get me wrong, it’s absolutely beautiful. Yet cities in general, and downtowns especially—with their pace, their noise, their busyness, their commercialism, their competitions, their comparisons—can gradually squeeze up on all your edges until the pressure becomes so intense you burst like the cork off a wine bottle. Where is there a safe space to step away from it all and tell the world how you really feel? I can’t help but think the terracotta vessels are a reference to ancient Greco-Roman days, when life was a little slower and technology wasn’t so all-consuming. The absence of technology in this installation stood out to me in a positive way. We don’t need gadgets to help us unwind. We don’t need gadgets to make a statement. Babak Golkar’s work invites us to rediscover what each of us has been equipped with since birth to respond to our ever changing world: our voice. Are we OK with using it? In this installation I was interested in screaming as a release but also a gesture or a form of contestation. 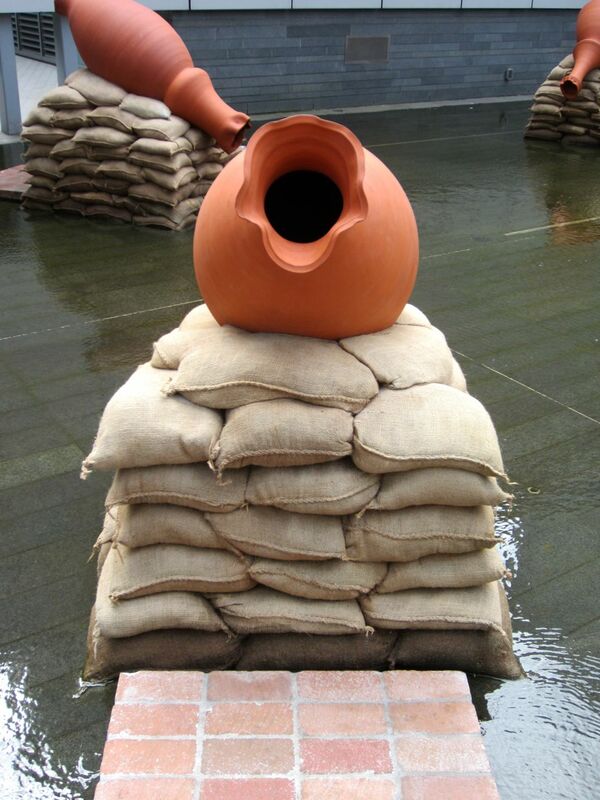 We tend to let go in private, not in public, and that letting go has to do with exposing our vulnerability, which here is reflected, not only by the action of participants through engaging with the works and screaming into the vessels, but also through the use of terracotta as a fragile medium. Offsite, located at the heart of downtown Vancouver surrounded by high-end residences, hotels and commercial buildings, offers a large potential for public engagement and it is this inherent gesture of offering to public that TIME TO LET GO… takes up and expands on. The site provided an opportunity to make a work that is acting as a context, a sort of a platform for public to be expressive and experience vulnerability in a public place, and be OK.
We live in a time that systemic conditions are overpowering our basic human conditions. Systems that once were consciously man made now exist firmly in constative modes. In these kinds of systemic entanglements, this project would pose, is there any room for active and reflective thinking and affective criticism? Are the systems muting us in effect? 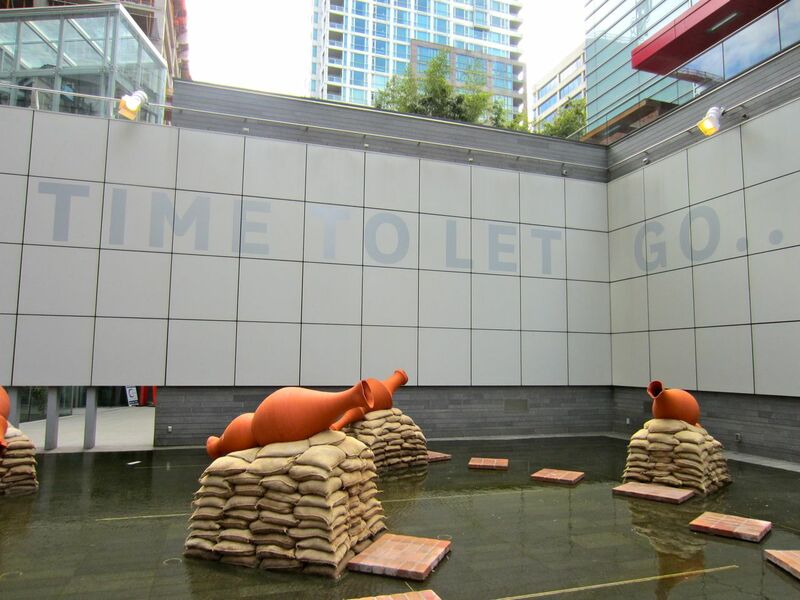 This entry was posted in Art, Space & Society and tagged Babak Golkar, Frozen, Installation art, offsite Vancouver Art Gallery, Public Space, Time to Let Go by Charlene Kwiatkowski. Bookmark the permalink.